Public realm enhancements beautify a downtown's core. In 2009, through a collaborative process with the Capital Crossroads Special Improvement District (SID), a Downtown Public Realm Enhancement Study was created for Columbus, Ohio. The study identified creative concepts for areas within the right-of-way of the SID boundaries that can be implemented over five years. One of the priority areas was Capitol Square, the historic epicenter of Downtown Columbus. The scope of the Capitol Square Streetscape Improvements project consists of streetscape elements and landscape plantings designed to provide a vibrant and consistent street character in the heart of downtown. The streetscape amenities include decorative poles for street signs and hanging baskets, a branding icon for the decorative pole tops, and freestanding planters. MKSK collaborated with local artist John Soichi Sunami on the design and installation of the 65 planters including 10-ft-tall metal planters and shorter 4í-tall planters of cascading and flowering annuals. The tall planters feature a cutout of the iconic Statehouse rotunda and elements from the State Seal of Ohio. 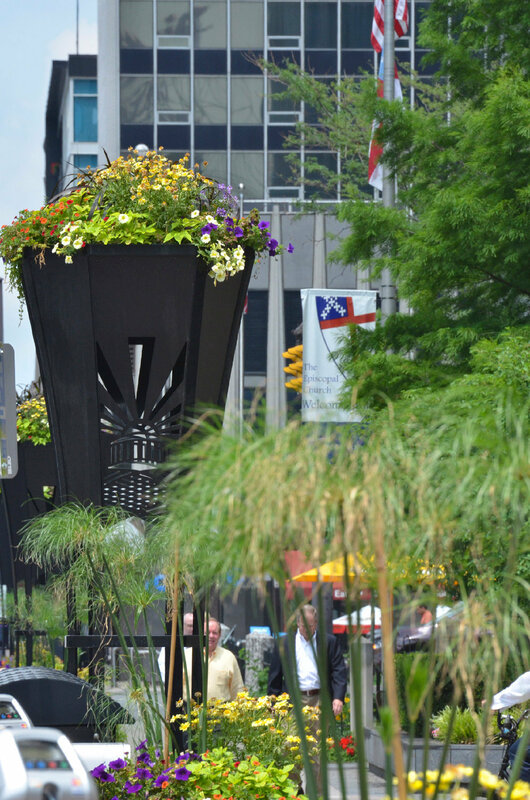 Anchored along High, State, Third and Broad Streets across from the Ohio State Capitol, the planters are designed to be visible to motorists, office gazers, and pedestrians and feature three planting designs to accommodate the seasons.